How ya gonna keep ‘em down on the farm/ After they’ve seen Paree! The World War I song (1918) does not represent the women doing the farming in France after their men take off for the war. They’re as likely go on a world tour with Maupintour as go to Paris. How ya gonna keep ‘em on the farm? Simple: without their work the land goes kaput, and that’s the last thing these women—call them Rosies the Riverters based on the land rather than in factories—and subtracting a couple of decades. Xavier Beauvois directs this epic style picture (when he is not performing in an array of other pictures), a man known for his “Of Gods and Men” about Trappist monks in Algeria who must decide whether to stay or leave when that country is threatened by terrorists. By contrast the women in “The Guardians” have no place to go as they must keep up the acreage they own when their men are off to war. 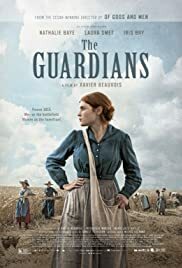 “The Guardians” is a women-centric work done in a classical style, lots of long takes so that we in the audience can register the emotions of women who worry daily that their men may not return and who take out their anxieties in part by some awfully hard farm work. Under the supervision of Hortense (Nathalie Baye), the women get around on horse-drawn wagons when they are not leading oxen to harvest the land. They feed and milk the cows, grind the wheat, and are unable to take advantage of much in the way of modern harvesting machinery—though in one scene an older man demonstrates a coffee-making machine to a group of Americans assigned to the farm while awaiting orders to fight. Now and then, women are told that their husbands or sons will never return, the news spread by a man wearing a suit and tie as opposed to the current method here of being greeted by two Marines knocking on the door. The bad news arrives for Hortense who need not see a man in military uniform to know that one of her sons is dead, while later, another woman using Francine’s services is given the same awful message. A major change occurs when Francine is fired, despite being the best worker that 40 francs a month can buy, a traumatic event for Francine that occurs during the time that Americans, treated here as stereotypical wise guys, are introduced. This is a film by a male actor-director who apparently knows how to assure us that women are as good as men, the script adapted from Ernest Perochon’s 1924 novel “Les gardiennes frenchz,” which surprisingly is unavailable at Amazon despite the potential tie-in with the film. I can’t say, therefore, that the book is better than the film or vice versa, but given the vistas captured by Caroline Champetier in widescreen lensing, we get at least as good an idea what of farm like was like in Europe during the early part of the 20th Century. At the same time, the long takes gives us in the audience time to concentrate on the emotions of the women on the farm as shown subtly in their expressions. Iris Bry makes her successful debut as a woman troubled by her status as an orphan while Nathalie Baye in the principal role clues us in to the hard life of an older woman with demanding physical work, who must at the same time suffer emotionally when dealing with sons that appear to have P.T.S.D.